One of the newest creations released to the public! 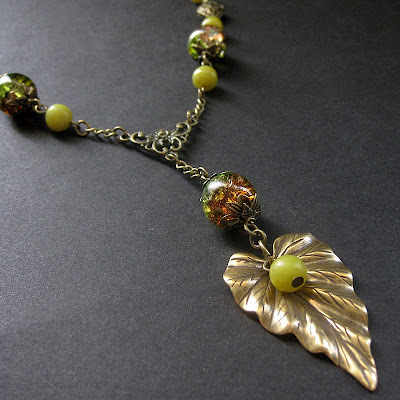 When I saw this aged brass leaf pendant, I knew exactly what I wanted to do with it. Between the time I ordered it and when it arrived I had already collected all the different components I'd need to design this handmade jade necklace and was more than a little excited to start the piece. Made with two-tone crackle glass beads in green and brown combined with pea green jade rounds and lots of little bronze accents, this artisan designed necklace is both elegant and earthy. It has been designed with an extension chain for the clasp, too, allowing it to be worn at a variety of lengths.